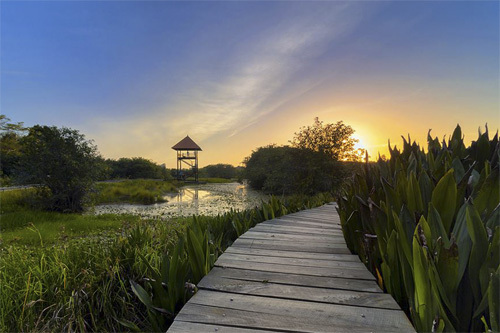 Have you ever walked along the quaint nature trail of Beddegana Wetland Park located in midst of old city of Sri Jayawardenepura Kotte, Sri Lanka? It weaves its way through the cluster of overgrown shrubs and low hanging vines. It offers one an experience of walking through a forest, albeit with less risks. The refreshing gust of cold air wraps around, as one steps into a beautifully done haven for nature lovers. Once you do so you could witness the flock of Lesser Whistling Duck resting upon the waters of the marsh. Lesser Whistling Duck, Dendrocygna javanica is a small whistling duck which breeds in South Asia and South East Asia. It is also called as the Lesser Whistling Teal, based on an older classification or the Tree Duck. 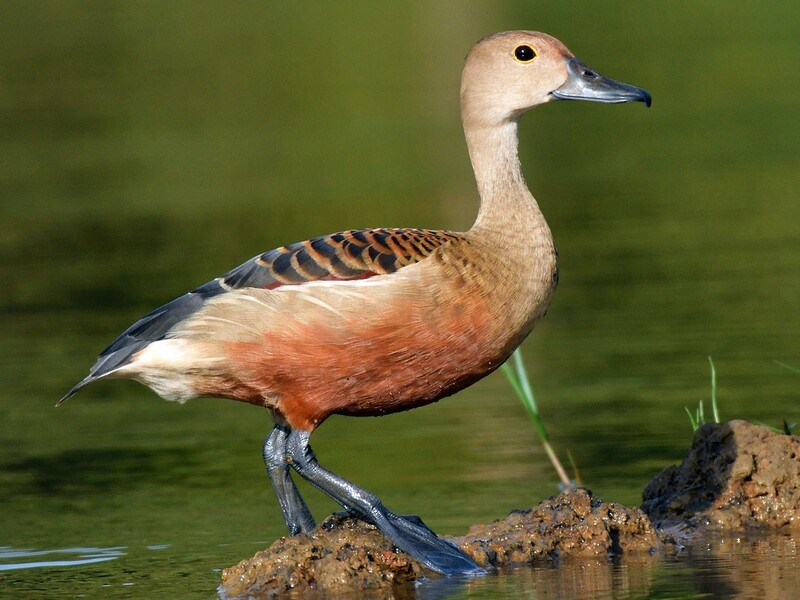 According to Scientific Classification; Lesser Whistling Duck belongs to the Class Aves, Order Anseriformes, Family Anatidae, Subfamily Dendrocygninae and Genus Dendrocygna. Whistling Duck which is called Heen Thamba Seruwa in Sinhala Language has few other common names such as Indian Whistling Duck and Javan Whistling Duck. This rather shy bird has a long grey bill, long neck and longish legs. It has a buff head, neck and underparts, and a darker crown. The back and wings are darkish grey, and there are chestnut patches on the wings and tail. All plumages are similar. 38–42 cm; 450–600 g. Smallest of the whistling-ducks. Dull, plain, uniform plumage; round wings with chestnut colored lesser and median upper wing-coverts, and upper tail-coverts. Middle of nape and hind neck are slightly paler than sides of neck. Has a flank with indistinct thin white streaks dark head cap with rufous fringes to mantle feather and scapulars. Inconspicuous yellow eye ring is kind of characteristic to Lesser Whistling Duck. Juvenile are duller than the adult; more greyish brown with a paler crown. Hatchlings are darker grey-black in color with white patches. A largely resident species distributed unevenly from the Pakistan lower river valleys eastwards across most of peninsular India, Nepal, Sri Lanka, Bangladesh, Burma, Thailand, Malaysia, Indonesia, south China, to Vietnam. These small yet amazing birds lives around still freshwater lakes preferring freshwater wetlands, especially shallow ponds and marshes, with plentiful vegetation, where it feeds on seeds and other vegetation. They are often seen perching on trees near water bodies, giving rise to the alternate name ‘Tree Duck’. Regardless of the size, Lesser Whistling Ducks have a call which is a wheezy, whistling “seasick, seasick” call, uttered during flight. 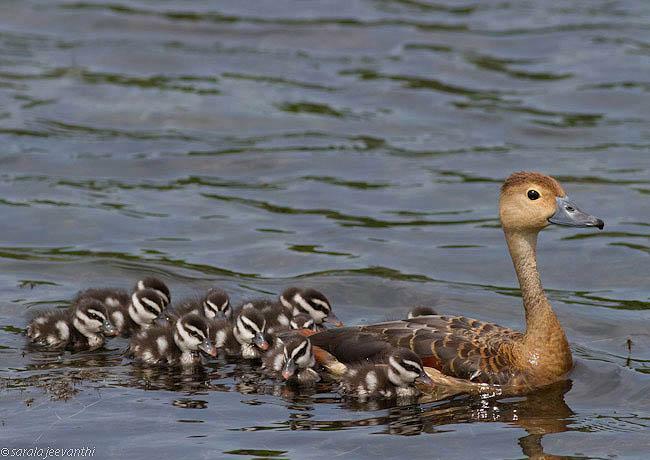 Whistling Ducks generally feed on larvae and pupae often found under rocks, as well as aquatic animals, plant material, seeds, small fish, snails and crabs. Feeds mainly by dabbling the water surface for floating vegetable matter but also taking in insects and other aquatic invertebrates. One who observed them during the day time come to believe they are among the laziest members of Bird family. It is not surprising, considering that they spends much of its time foraging for food in close-knit family flocks. Often dives. They dabble as well as dive in water. A rather nervous species liable to take flight at the first sign of danger. Can be active both in the day and night, depending on degree of disturbance. They are nocturnal feeders that during the day may be found in flocks around lakes, mostly resting and sleeping. It nests in tree holes, old nests of other birds or on a stick platform near the ground. Each clutch can contain 6 – 12 eggs. The eggs hatch after about 22 – 24 days. More than one brood may be raised in a single season and young attain maturity in 3 months. Courtship involves the male facing the female and dipping and raising its bill in the water and swimming around the female. They breed during the monsoon or rainy season and may vary locally in relation to the food availability. Season determined by extent of rains but tends to coincide with start of rainy period; in Sri Lanka mainly in December – January and July – September. Whistling Ducks have found to be showing “Broken-wing Display”. The distraction displays, also known as diversionary displays are anti-predator behaviors used to attract the attention of an enemy away from an object, typically the nest or young that is being protected by a parent. Parents nursing hatchlings is a sight to sore eyes. They show immense care for their young ones. Teaching them to dive into water and guide them. As always as kids are, Whistling Ducklings are curious all they could be. However they are fast learners giving you no time to catch up with their growth. It’s one’s choice to engage in bird watching. But to witness the extraordinary life of this awesome bird is a luxury only few lucky people get to enjoy. If you are a nature lover, and a fan of these lovely creatures, Beddegana Wetland Park is a place you should visit often. But always be careful to enjoy without disturbing their quiet and peaceful life. Then they will surely give you some unforgettable experiences in your life.